Have you ever thought of whisking a raw egg yolk into your coffee? Then adding a dash of cheese and cinnamon? Although the original recipe is a closely guarded secret, it must be good as this particular cafe has been serving their egg coffee to customers since 1946. We tried it and loved it. This might sound like an odd combination, but it does taste divine. Something I have heard as described between a warm tiramisu and a coffee Cadburys creme egg. At Giangs in Hanoi, the extra ingredients are a secret, but it is whispered to me butter, cheese and cinnamon may be involved, along with an added extra something. Invented out of necessity in the mid 1940s when milk was scarce, egg coffee (cà phê trúng) is a firm favourite today with both locals and visiting foodies seeking an authentic taste of Hanoi. Served hot or iced. Hot is the original way and arrives with the cup sitting in a bowl of hot warm to retain the temperature. Giang Cafe, (39 Nguyen Huu Huan) in the old quarter of Hanoi for an authentic and local experience. 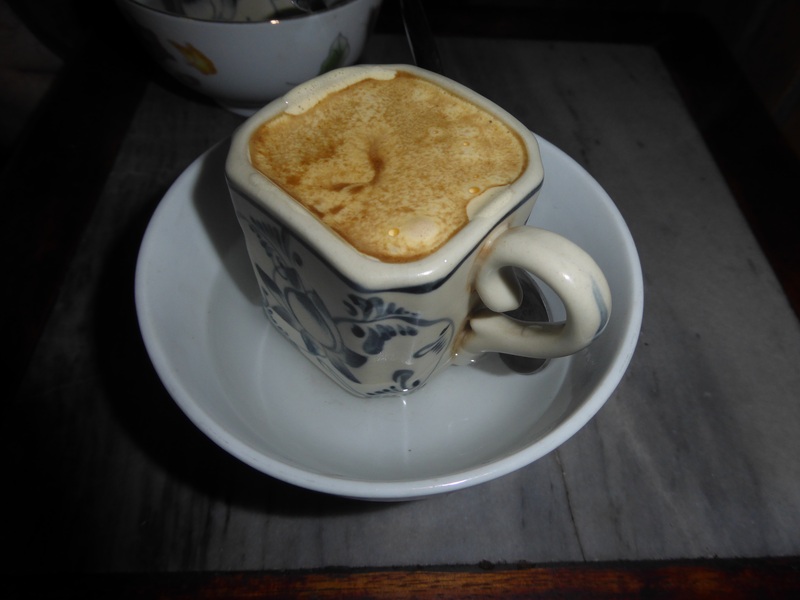 If you can’t wait to get to Hanoi or fancy a change to your normal coffee, the basic version is easy to try at home. 2-3tsp Vietnamese coffee *(alternative ingredient – Ground expresso will work, but add a little sugar. Vietnamese coffee beans are sweetened when roasted). In a separate bowl, whisk together the egg yolk, condensed milk and just one teaspoon of the brewed coffee until you get a really thick fluffy mixture. Pour your coffee in a cup and top with the mixture. You should have at least half the cup with filled with frothy, fluffy yumminess. Serve with a spoon to stir as you sip.